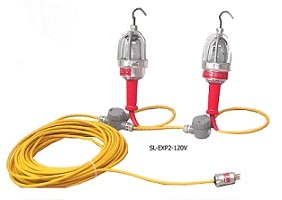 PORTABLE LED EXPLOSION-PROOF STRING-LIGHTS 12-VOLT are the most common explosion proof lighting product used within confined space entry tanks and vessels. The hand lamps that are used on these string lights have a rating of Class 1 Division 1, Group CD-FG. 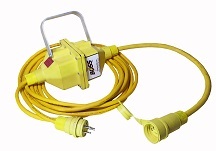 Can be used with bulbs rated up to 240 volts. These explosion proof hand lamps are designed to be hung by their hooks. Never use the string light cords to allow the hand lamps to hang upside down. Water will seep down the cords and into the wiring compartment of the hand lamp. This will automatically void OEM warranty. The String Lighting are available with 2 to 8 hand lamps on strings. Strings range from 50′ thru 150′. There are 10′ spacing between hand lamps with 3′ cord drops. Each string light will have a trailer cord. The is the cord length between the last hand lamp and the plug on cord. Allows the string light to be plugged outside of hazardous work areas.